Christine Ralphs’ Newest Home Design. Unadorned floor-to-ceiling windows offer a spectacular view. 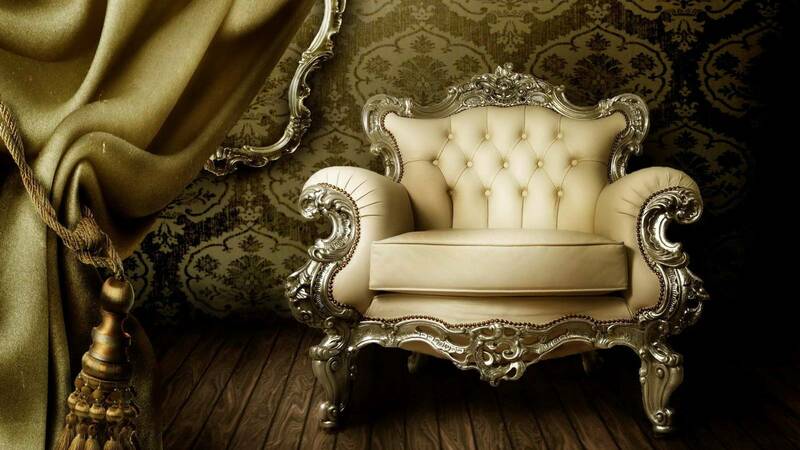 A simple sofa upholstered in brown fabric adds a masculine touch to an otherwise feminine environment. Clear lucite pieces, such as the Ghost chairs and the curved coffee table, allow the light to flow through. An oversized mirror is perfectly proportioned for the space and, adjacent to the windows, bounces light across the room. Touches of gold carry through Christine Ralphs’ home. Mixing a vintage metal sculpture with photographs brings architectural interest to a striking black and white art wall. 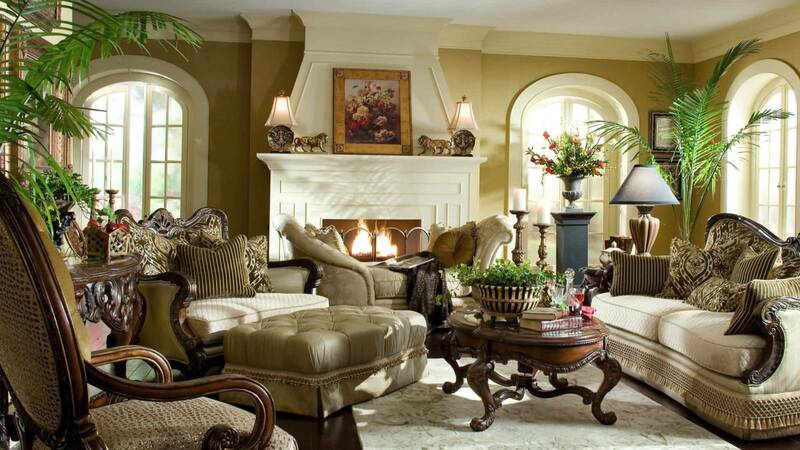 The streamlined faux fireplace is not meant to look real. It’s just for fun, but it also organizes the room by providing a focal point. Products:Scribble art (two pieces), PI Fine Art; black vase (on coffee table), The Elegant Garage Sale. Storage is everywhere in this contrasting kitchen, from the ample island to the floor-to-ceiling black cabinets flanking the white cupboards. The crisp palette, warmed by global accents, is a signature Lloyd Ralphs look. 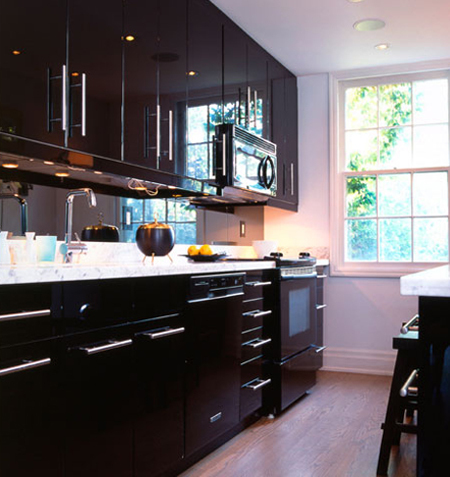 Products:Countertops, Marble View; cabinets, gold faucet, Ikea; hardware, Ginger’s & Summerhill; pendant light, L’Atelier. 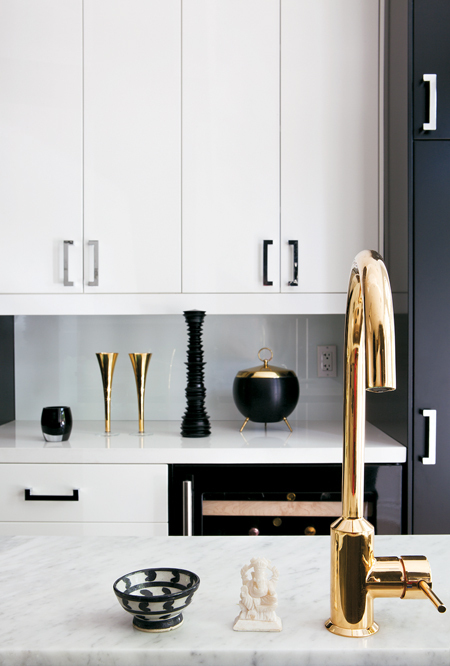 A gold faucet adds warmth and sparkle in the kitchen. The warm metal looks luxurious set against Christine’s marble countertops. Chrome hardware on the cupboards proves that mixing metals works beautifully. Products:Gold flutes, William Ashley China. 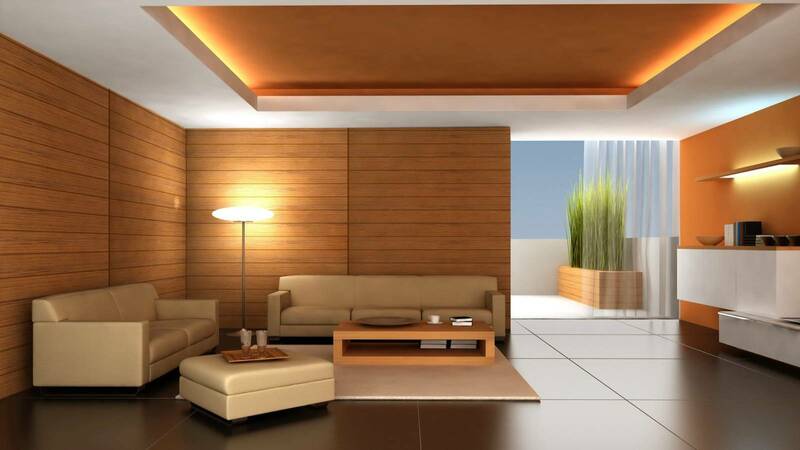 Consider white walls and pale wood floors to lighten an airy, open space. 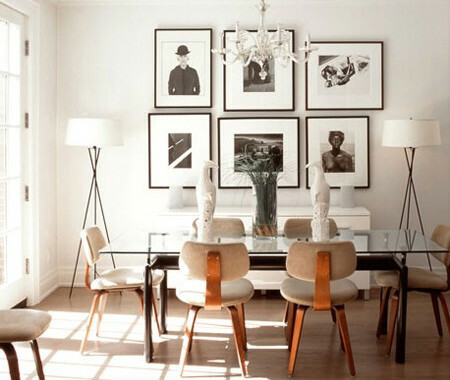 Symmetry is key in the layout of this dining area. A pair of floor lamps sit on either side of a black and white photography display. Two white bird sculptures are perched atop the table, which is surrounded by casual, Eames style chairs. The delicate lines of the glass dining table make the room look even more more spacious. A thick-striped headboard balances out the bold zebra-print rug. 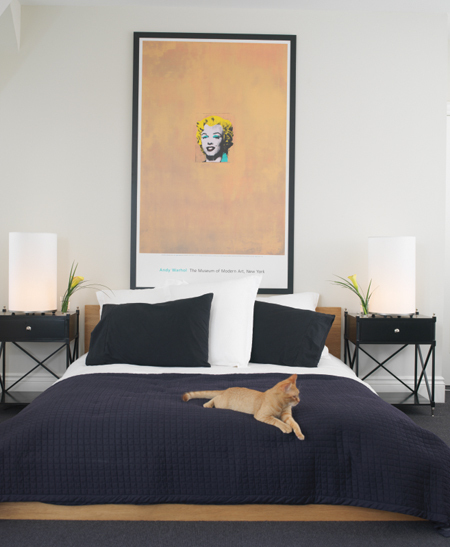 The neutral scheme found throughout Christine’s home continues in the principal bedroom, accented with bold hits of black. A small mirrored desk reflects light below the window. Products:Throw, Calypso St. Barth; table lamp, Queen West Antique Centre; lampshade, Aristocrat Lamps and Lighting. A bright and stylish space to get ready each morning. Instead of bookcases, Christine displays her fashion books on top of wardrobes so she can find inspiration every day while getting dressed. Framed art is layered on the floor, leaving wall space for a dressing room essential: an oversized mirror. Products:Light fixture, Studio Pazo; rug, cabinets, Ikea; floor lamp, Absolutely Inc.
A bulletin board filled with constantly changing tear sheets, jewelry and inspiration. 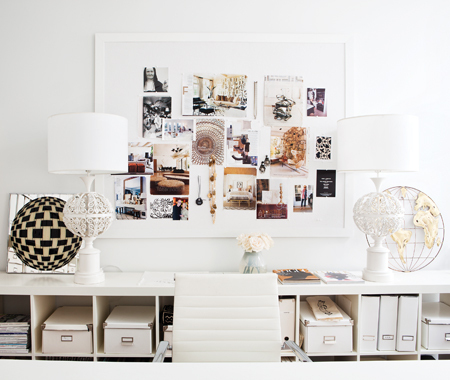 In the office, simple storage boxes maintain a sense of order and create a beautiful display. Open shelving looks calm, not chaotic, thanks to the all-white scheme and closed containers. Drawers of many shapes and sizes accommodate storage needs. In the principal bathroom, mirrored walls and glass panels play with one’s perception of space. An overall white palette keeps the look immaculate. Products:Mirrors, Verdi Glass & Mirror; faucet, Roman Bath Centre; cabinets, Ikea. A side-mounted faucet makes the most of available space. This tiny sink in the powder room even offers storage underneath. 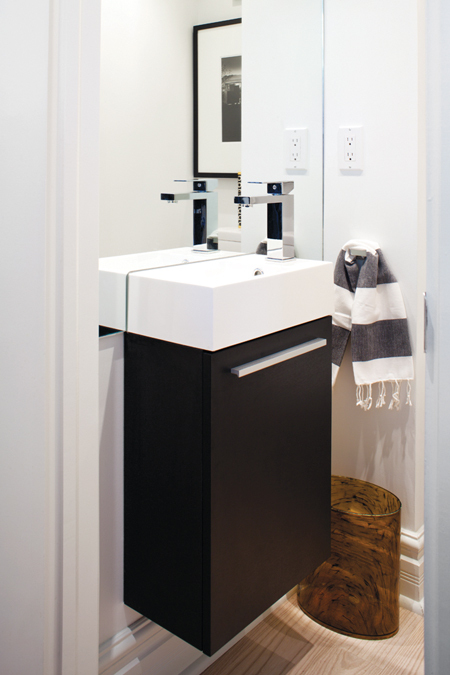 Keeping the mini-vanity off the floor creates a sense of space. Products:Vanity, faucet, Roman Bath Centre; mirror, Verdi Glass & Mirror; towel, Absolutely Inc.; hardware, Ginger’s & Summerhill. Chic plastic furniture is weather and dog-proof. Interior designer Christine Ralphs loves to lounge on her back patio with her wire fox terrier Bitsy. Decorated in her trademark black-and-white colour palette, this outdoor sitting area — outfitted with Philippe Starck’s polypropylene Bubble Club Sofa — requires little upkeep. 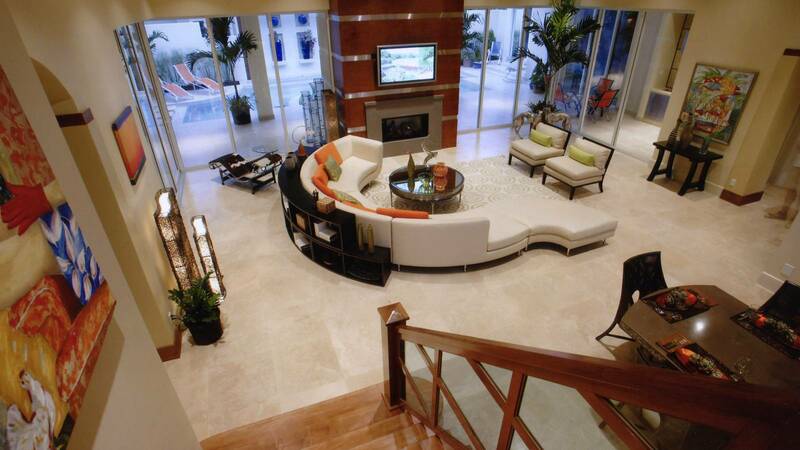 Impressive proportions create an entryway like no other. Panelled walls, abundant natural lighting and original pegged beech plank floors make a definite statement in this entrance. A Mission-style pedestal table set on a modern zebra-print rug greets visitors. 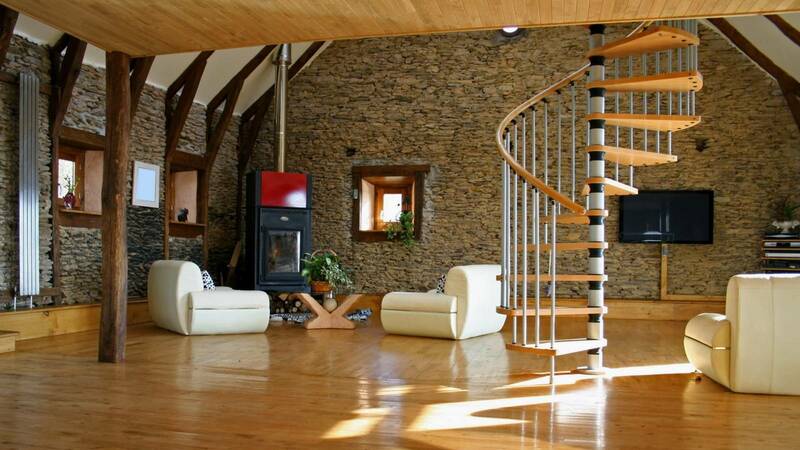 The glossy black stairs and railing stand out against the crisp white walls. Products:Table, L’Atelier; rug, Calypso Home; stair runner, Elte; lamp, Ralph Lauren Home; black staircase paint, Scandinavian Painting. 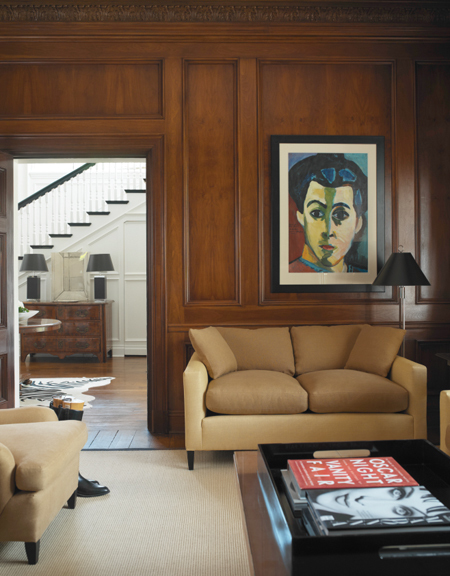 This 1920’s Toronto residence captures the owners’ passion for art and architecture. In this living room decorated by Lloyd Ralphs Design, a contemporary sofa, chairs and ottomans are juxtaposed with standout pieces like a Gae Aulenti coffee table, an Ashley Hicks cocktail table and sculptural accessories. Splashes of burnt orange and animal print pillows complement the room’s warm palette. 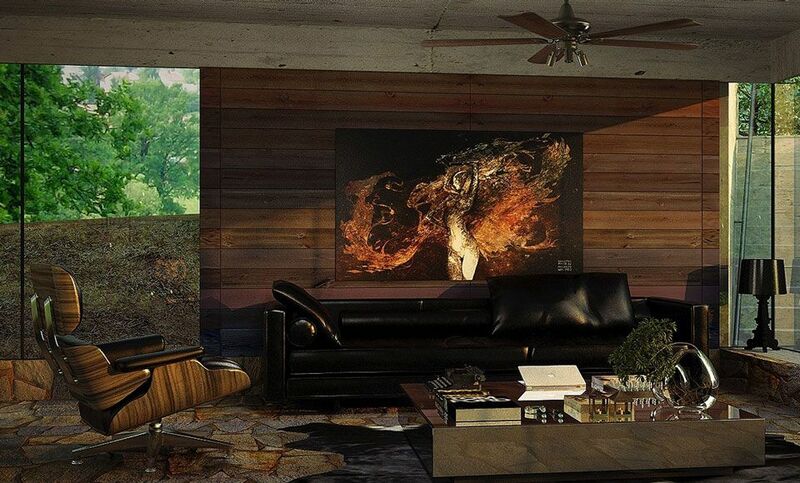 Products:Ottoman, lamps (on desk), sofas, club chairs, Ralph Lauren Home; rug, Elte; cocktail table, Industrial Storm; drapery, BML Imports; white upholstery, Frank Veteer Custom Covers; artwork: Animal Language #1 by William Fisk (left of door), Nickel Tailings #39 by Edward Burtynsky (right of door), And She Was by Gareth Long (on mantel). Contemporary artwork creates a colourful focal point in this formal room. Raffia-cloth upholstery plays up the warmth of the walnut-panelled walls. A large painting by the homeowner’s daughter adds levity. Products:Upholstery, John and Chris Interiors; lamp, Ralph Lauren Home; coffee table, Industrial Storm; tray, West Elm. Transom-topped French doors create an inviting, light-filled environment. Slipcovered Parsons stools complement the cream palette and augment the room’s airy look. 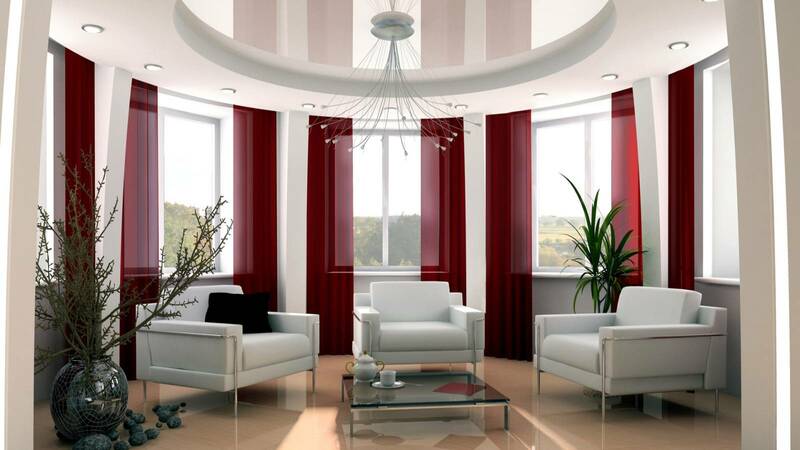 Large lamps with clear glass bases and neutral-coloured lampshades bring a modern note to the space. Products:Slipcovers, BML Imports; lamps, pedestal (with lemons), L’Atelier; hardware, Summerhill Hardware; wall colour, Decorator’s White (CC-20), Benjamin Moore. Symmetry and bold artwork make a statement. In homeowner and TV personality Lisa Rogers’ home, the dining area boasts a curvaceous glass chandelier and coral-shaped candelabras. 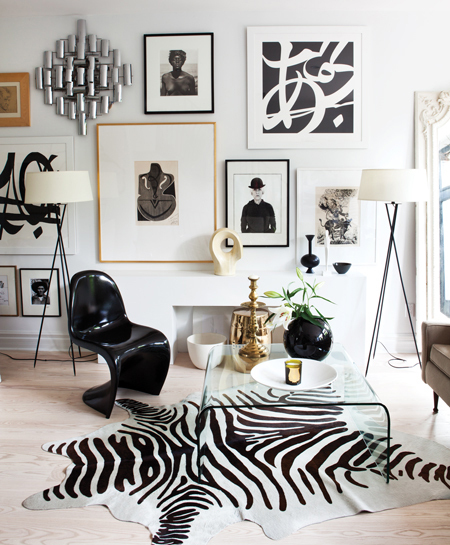 A graphic pattern in the artwork and a zebra-print rug also bring personality to the minimalist space. Products:Zebra-print area rug, Elte; chandelier, L’Atelier; dining chairs, South Hill Home. 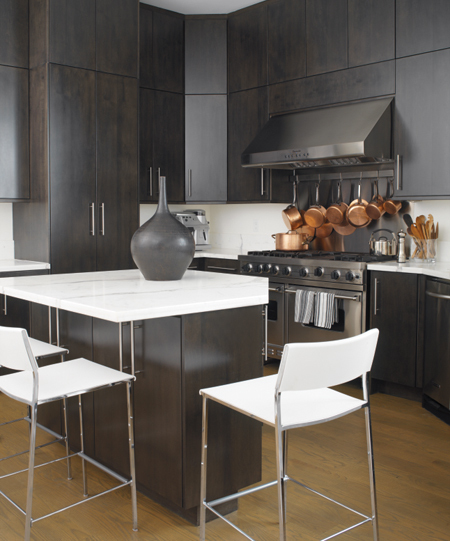 Products:Kitchen design, Lloyd Ralphs Design; vase, stool, South Hill Home. 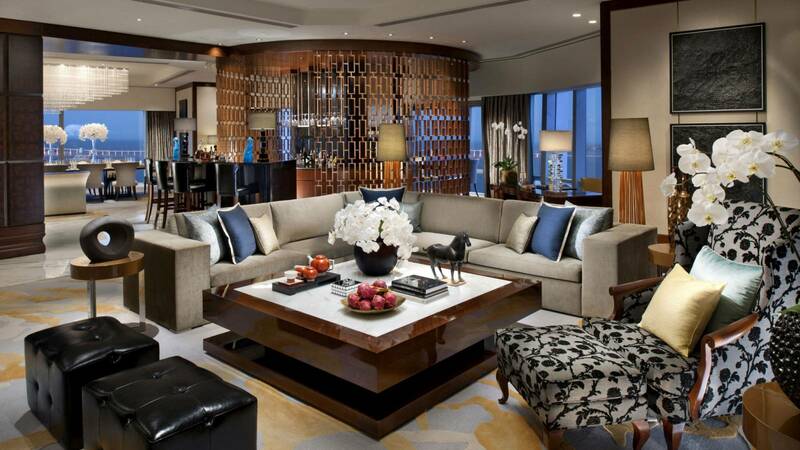 Modern elements meet classic details in this eye-catching space. This glamorous black and white living room is grounded by a graphic patterned rug. A chunky wooden side table adds warmth and a visual break from the bold palette. Curvy bergere chairs are an opulent antique counterpoint and the large pencil drawing of the homeowner’s children adds a personal tone. 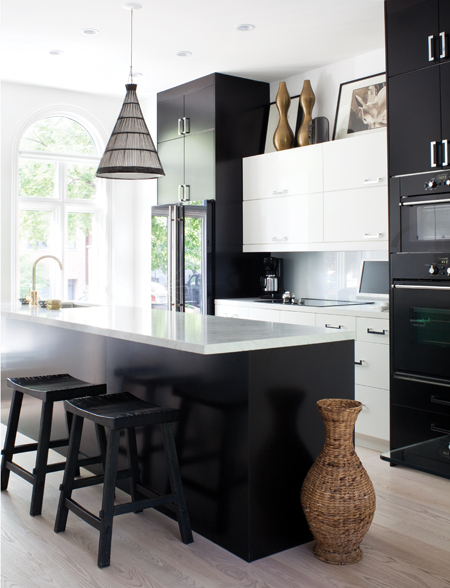 A stark black and white palette pops in this contemporary space. In this master suite, a soft taupe feature wall balances quietly luxurious elements, such as the sleek white upholstered headboard, mirrored side tables and lamps. 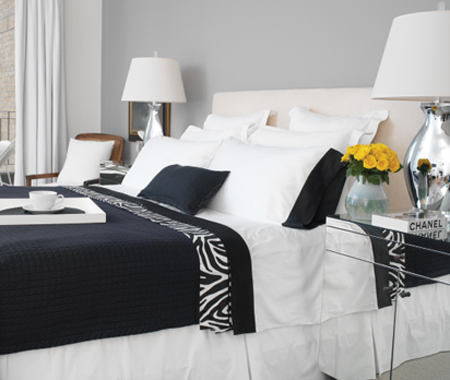 Black and white bedding is mixed with zebra-print sheets for added graphic appeal. Products:Black quilt, white linens with black trim, Au Lit Fine Linens; zebra-print sheets, Ralph Lauren Home; wall colour, Escarpment (CC-518), Benjamin Moore. A teenage girl gets the star treatment in this sophisticated space. It’s the epitome of the graphic-meets-glamorous look: a room inspired by a print of Marilyn Monroe by the king of pop art, Andy Warhol. The gold-toned bed is a warm contrast to the black and white furniture and linens. 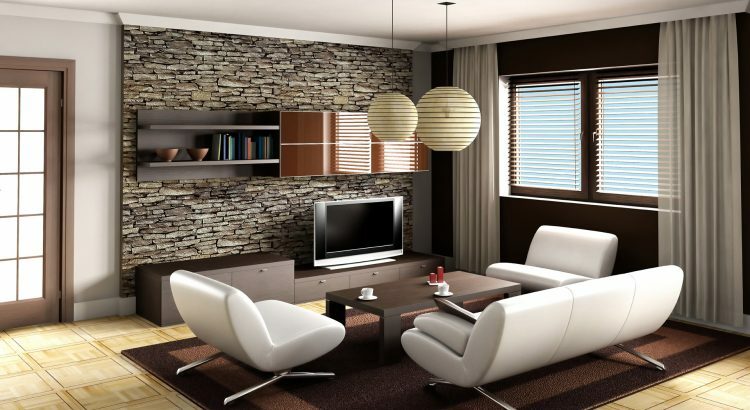 Retro-style lamps, on low side tables, suit the minimalist design. Products:Bed, Klaus by Nienkämper; lamps, UpCountry; carpet, Elte; side tables, Absolutely Inc.
Palm leaf artwork and a red vase subtly warm this room. With its ample wraparound windows, white Parsons desk and clear Philippe Stark chairs, this office has a breezy presence. The light look is grounded by striking artwork hung from floor to ceiling. Products:Parsons desk, Lloyd Ralphs Design; desk chairs, Philippe Stark chairs, Plan b Office. Modern teak furniture and feathery exotic plants give this back deck’s dining area a distinctly tropical air. The furniture and accessories are in sync with the home‘s interior, both in their clean lines and black and white palette. The colours also blend in with the spectacular waterfront. White accessories pop against a natural backdrop. 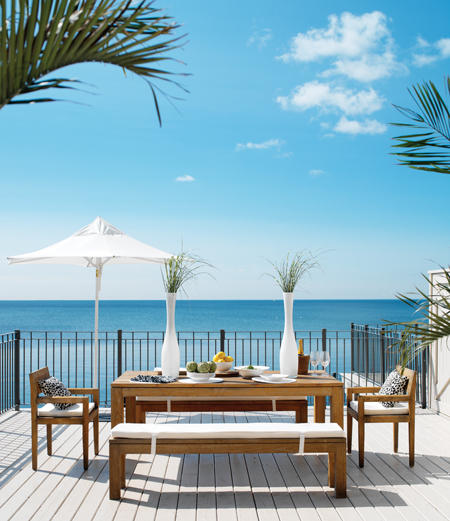 This 625-square-foot deck overlooking Lake Ontario is luxuriously appointed with beachy raffia-look furniture, resort-style umbrellas and potted palms and ferns. “The look all started when I got one big palm plant,” says Lisa. Products:Dedon sofa, coffee table, side tables, chaise longue, Studio b; lanterns, Constantine; silver platter, Pottery Barn; tropical plants, Summerhill Nursery; towel, Au Lit Fine Linens; deck floor colour, Litchfield Gray (HC-78) Benjamin Moore, Benjamin Moore; Missoni toss pillows and throw, HorseFeathersHome. Wicker, raffia and rattan accents offer texture and a casual, beachy note. Mixing playful, rough and unexpected objects with a sleek daybed and Saarinen-style table keeps this cottage from looking too precious. White paint, fabrics and Moroccan-style lanterns and cabinet lattice work create an exotic feel. Products: Elephant table, The Elegant Garage Sale; lamp, West Elm.